Experience powerful bass impact from music and movies with the NS-SW200PN 8" 130W Powered Subwoofer from Yamaha in piano black.. This dynamic subwoofer features a front-firing 8" cone woofer and is powered by a capable 130W amplifier. 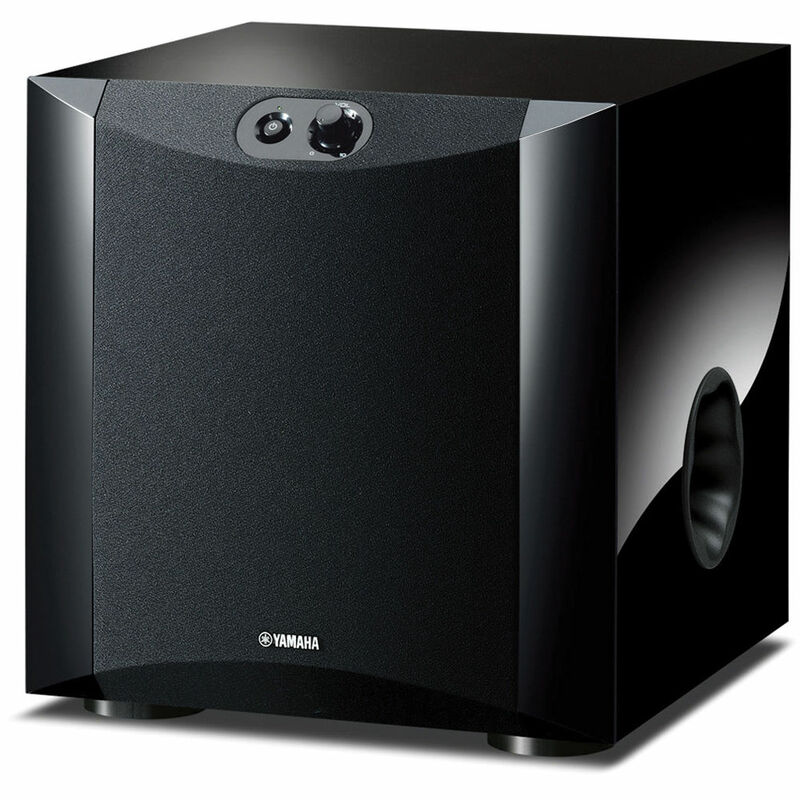 With a frequency response of 28 - 200 Hz, this subwoofer is designed to handle a wide variety of listening material. Advanced YST II technology is onboard for enhanced sonic accuracy. The Yamaha NS-SW200PN offers multiple connection options including direct LFE and line-level inputs. The rear-mounted system control interface allows you to connect the subwoofer to compatible amplifiers for automatic power on and off; a system control cable is included. As an added convenience, this subwoofer features front panel controls, which allow you to easily adjust the subwoofer's volume level, as well as a power button and LED indicator. The built-in power amplifier is engineered to deliver a stable power output of 130W with high efficiency while minimizing power consumption and heat production. It does not require an output filter coil, resulting in reduced noise and distortion. High speed transient response is also enhanced. The dual feedback circuit reduces distortion by applying feedback twice, resulting in optimal sound clarity. Compared to conventional ports, the Twisted Flare Port is engineered for a greater reduction of air turbulence noise, contributing to clear and accurate low frequency reproduction. The flared and gently twisted shape evenly diffuses the air flow through the port. Developed by Yamaha, the Advanced YST II (Yamaha Active Servo Technology II) combines negative-impedance and constant-current principles to drive the speaker cone for tighter control than the previous version. Using advanced negative impedance converter (ANIC) circuits, this system dynamically optimizes effective speaker impedance to maintain linearity. This contributes to a stable and accurate low range response as well as high sound quality. If no signal is input from the amplifier for a fixed period of time, the subwoofer automatically switches to a standby state. When a signal from the amplifier is detected, power turns on automatically. This is designed to limit energy consumption. The subwoofer features a round shape on the front surface and panels on both sides. These accents are designed to give the subwoofer a neat appearance. Box Dimensions (LxWxH) 16.7 x 14.8 x 11.2"
NS-SW200PN 8" 130W Powered Subwoofer (Piano Black) is rated 3.5 out of 5 by 4. Rated 5 out of 5 by Hugo from Small in size, super big in sound I use this woofer with my 5.1 chanel Yamaha system. I wanted to get something better than the previous Yamaha woofer i had, so i upgraded it. I love the clarity of sound, it is perfect for music and movies. I use it all the time while I am doing something else (reading, exercising, etc). I put this into a small TV room, so it fits perfect and the sound shakes all windows when i crank it up. My neighbor does not like me too much after I got this one though. When I first looked at it I thought OMG it is so small! so I almost return it before i even plug it. I gave it a try and i was so impressed with the quality and power of this little guy. I strongly recommend you try it and I am sure you will love it. Rated 3 out of 5 by Fred the Explorer from Could be better I use it with two other Yamaha speakers NS555 and this product, although is considered from the same family, seems not to be used with them. There is no banana plug, it does not come with a proper cable; the one it comes with is not for a high sacale receiver I am using with. I am a bit desappointed. I called B&H before and it was recommended to me because of my speakers set, but I think I should had choosen the NS-NS300 10. Rated 5 out of 5 by Vale from Excellent Powered Sub This little fella does a terrific job. The bass sound is tight, not boomy. When I listen to music the bass is clean. With movies the bass sound is clear, but if you're looking for something more powerful you should use a bigger sub. Overall, I love it. Rated 1 out of 5 by Fredo from It does not work I am here again, now to definitively complain about this subwoofer. It does not work! The subwoofers in the two speakers NS555 are enough and this one never turn on. It is supposed to turn on when needed and definitively it does not do it. I want to return it. Will this sub work with a third party receiver?